Caring Matters Now is a UK charity who work to raise awareness for CMN (Congenital Melanocytic Naevus) . Together with photographer Brock Elbank they have put together an exhibition of photographs of adults and children who live with CMN (14th – 24th March, Oxo Tower, London). I didn’t know about the exhibition until recently and having a child who was born with a very large CMN, I am hugely excited that the public are being told more about this condition. Even better that it is in such a powerful visual way because CMN is beautiful and should be understood and celebrated. Here is just a little part of our story. It had been a really long night, we’d come to John Radcliffe at 7pm the night before (a Sunday… never a good day to go in to labour!) when my waters broke. This was my second baby and I was 3 weeks early which wasn’t a surprise as son number 1 had come sneezing in to the world 5 weeks early. Apparently I have an “incompetent cervix” which means my babies can’t stay where they’re supposed to be – frankly whoever thought of that name, seems far more incompetent than me or my cervix. I was in theatre for a long time for reasons beyond my incompetent cervix, it seems I’m just not that great at having babies. I stayed in hospital for a week and started to get to know my little boy who did indeed have a birthmark which covered 60% of his body. It was perfectly and wondrously symmetrical and stretched from his tummy button down to his knees and high up to a point on his back. That first week will always remain a little bit blurry and hard to recall, I was on a lot of morphine and I was trying to understand why my baby looked the way he did. No one at the hospital seemed to know what it was, no one could give it a name and when a nurse would come in to change his nappy, they’d often gasp when they removed his baby grow which would make me immediately protective and defensive and confused. I was scared and I wanted someone to tell me that there was no reason to be and that my baby was fine and beautiful and unique – which deep down I knew he was. There was one day when we were still in hospital when Jay Jay and I started talking about names. He was always going to be Carter (his big brother’s called Cash!) but the middle names hadn’t been decided yet. My husband is ever the optimist and his cup is always half full, I’m a little different, I’m not a pessimist and I consider myself incredibly rational but I do suffer with anxiety and so I question everything very deeply. Jay Jay wanted to call him Patch, as a celebration of his birthmark, to send the message to him and to everyone that his skin and his difference should be celebrated and shouted about. I didn’t agree. I wanted to protect him from whatever this was, from the unknown. I wanted to guard him from other people’s questions and stares. I wanted to find out what kind of person he was and how he wanted to manage his skin. I had no idea if he would ever want anyone to know, he might want it to be a secret, he might not want to lift up his t-shirt and show people. How do you know the character of a person when he is barely one week old. A really lovely midwife sat with us in the hospital room while we battled this out, while I cried and Jay Jay tried to listen and to understand why I seemed to want to hide our baby away. In the end we decided not to include Patch in his name and although Carter is in no way embarrassed about his skin, he’s pleased that we made that decision. I’m just sorry that Jay Jay’s positivity lost out to my anxiety – that must have been incredibly hard for him. We were finally allowed to go home where I hid away with Carter and Cash for quite a few weeks. I said no to any visits by health visitors as I didn’t want their opinions on something they knew nothing about. I hated seeing people’s reactions when they saw his skin as it simply made me angry and more frightened. Our families were great although I know it was hard for everyone, they all had questions and opinions but I didn’t really allow anyone to ask or give them. I needed to understand this first and then I could explain it. We went to a specialist mole doctor in Oxford when Carter was just a few weeks old and were told that he had never seen anything like this before in his life and couldn’t help. We then went to the Cromwell Hospital to see a fabulous man – who’s name I forget – who had once been at Great Ormond Street Hospital and took one look at Carter and said “he has Congenital Melanocytic Naevus and he’s very beautiful indeed”. He described the condition, which is to do with pigment and melanin, like this, ”imagine a herd of wildebeest looking for water. They all follow the one in front huddled together until the first gets to the water’s edge and stops. As soon as this happens they all fall on top of each other and form a giant pile of wildebeest” This is what happened in the first 12 weeks of my pregnancy when Carter was forming, but with pigment rather than wildebeest. The pigment was being sent all over the body to determine the colour of Carter’s skin but it got to an area and it all backed up forming a deep brown pigmentation across 60% of his body. It started from his spine and stretched out, all the way round until it met his belly button, covering every little patch as it went. It did a pretty good job as it has created the most beautiful shape which wraps around him like a delicious, warm hug. He referred us to the CMN unit at Great Ormond where he would have an MRI when he was just 6 months to see if any of the pigment had reached the brain, sometimes this happens and can cause learning difficulties or similar. He had already looked Carter in the eyes and told us he thought he was absolutely fine so although sedating your baby and sending him in to an MRI tunnel is a hideous thing to have to do, I was hopeful that the results would be good and they were. Carter is now 8, I can almost talk about him without crying. I don’t cry because I’m sad that he looks the way he does, far from it, I cry because I am sad at the way I have dealt with being given this amazing little boy. I’m crying now, but the difference is that now I know who Carter is and he is the one who makes me strong. Looking back at the first few months I can see that I was most probably suffering from a form of PND, I know simply by the fact that I have no baby photos of Carter splashing about in the bath or playing in his nappy that I was not dealing with any of it very well at all. I didn’t understand it and was scared of what I might find out and so I didn’t ask enough questions. Something I regret more than you can imagine. I remember one time when Carter was just 11 weeks old and the boys were being looked after by a lovely friend of ours who had offered to help out and give me a break. I was tired, more tired than I think I’ve ever been. She loved the boys and took some gorgeous photos while they were playing and there were a few of Carter lying in the sunshine in nothing but his nappy. His beautiful brown tummy and legs there for all to see, as they should be. She posted them on her Facebook page and thought nothing of it, she didn’t see that he was different, she just saw that he was beautiful. I saw them and I went in to crazy mode. I screamed for Jay Jay to call her immediately and tell her to take them down. I didn’t want anyone to see them. These were private photos and I didn’t want anyone seeing Carter like this. Would I have reacted like this if it had been Cash? I don’t think I would and I’m still sad and ashamed that it made me feel like this. That I was so frightened by what people might think or say about my baby. That I had such a screwed up sense of what was acceptable and normal. CMN is something which effects just 1 in 500,000 people. I had a baby that was one in half a million and that terrified me. One of my closest and dearest friends and godmother to Carter came to meet him for the first time when he was a few months old. I’d written to her and told her about his CMN and told her I was scared of it and that it was making me scared of so many other things. I don’t think I ever really truly thought of Carter’s CMN as being something bad that had happened, I was just so frightened by people and society and how he was going to deal with it that it sent me into an irrational spin. How could I ever ever think of him as anything other than amazing beyond words. Carter is part of the CMN department at Great Ormond Street Hospital, he was first seen by Dr Veronica Kinsler when he was just a few months old and has been monitored at various intervals ever since. He has been photographed and mapped to keep track of the freckles and moles and to keep an eye on any changes there might be within the largest area of his naevus. There is a higher risk of childhood melanoma in children with very large CMN and so it’s important to keep an eye on things. It’s also important that this is done by the trained eye as I can drive myself (and Carter!) crazy looking for anything that might have changed! It’s like trying to read a foreign language I’ve never learnt. When he was born he had the one giant naevus (which refers to any type of mole we’re born with) which covered his back, bottom, tummy and thighs, he also had a large circular raised patch naevus on his shoulder which he has always referred to as the “King”. He had very few satellites (freckles / moles) when he was born, just one on his face and maybe a couple on his legs and a larger one on his arm – to be honest I can’t remember too clearly when they all started coming. Over the years they have continued to appear all over his body and face, some are tiny little pin pricks and others are larger, more like a mole but not quite as raised. Often it feels like they appear over night and I find myself asking him if he recognises any new ones to which is always looks at me, shrugs his shoulders and says “hmm, who knows mummy”. He loves every single freckle and has his favourites as do I. He has a cluster of three on the back of his calf which look like a paw print, I love that little paw, so does Carter. He also has them on the soles of his feet and on his hands, these are more like freckles, they’re flat and more of a tea stain colour than a brown raised mole. Some of the bigger ones have tufts of golden hair – it looks like gold thread, it really truly does. His primary naevus is covered with a soft gold down, we call it his fur because his middle name is Fox and he likes the idea that he has a coat like a fox. The fur keeps the skin and his body warm as he has very little fat tissue under this main part of the body. The skin of a CMN is very different from “normal” skin, it has a different texture and is extremely delicate. It can also tear very easily which is something we and Carter have had to understand and cope with over the years. There was a moment, when he was a baby, when I tore his skin with my engagement ring. It’s not a big ring and neither is it very sharp but I caught him in just the wrong place and in just the wrong way and I ripped his skin. It was horrible, he screamed, I screamed, and then very quickly he calmed down and so did I. The skin had peeled back as though it had been burnt and exposed the bright red flesh underneath but there was very little blood. I didn’t know what to do, I was scared to dress it incase I ripped the skin again but also didn’t want to leave it uncovered as it was on his back and would rub against his nappy and any clothing. Carter was crawling at this point and I remember him crawling away from me to where his play-mat was on the floor, he lay down on his tummy, calm as anything and just stayed there. It was almost as if he knew exactly what to do, he just needed to stay calm and keep still and let his skin do the rest. The same thing would happen a few years later when he banged his back on a table whilst playing and went in to a type of shock, I presume from the intense pain of hitting a bone against something hard. He shook a little and looked as if he was screaming but silently, he then took himself in to the other room where the sofa was, lay down on his tummy again and started breathing really deeply. He lay there like this for about 20 minutes, completely conscious but completely silent and totally calm. I sat at the end of the sofa looking at him and stroking his hair and trying very very hard not to cry. And although there was a huge part of me that wanted to scream and tell anyone listening that this WASN’T FAIR and my child should NEVER hurt like this, I also realised that my boy is golden and strong and bulletproof. A condition like CMN has to be managed and of course there are things he can’t do like certain contact sports at school, but it’s becoming easier to live with every day. My insistence early on, and until very recently, to keep Carter’s CMN private, to never tell anyone about it unless they asked directly and to never make him feel different in any way, I know now was just my way of protecting my own insecurities. Of course I did it to protect him from cruel words or silly questions or misplaced gawping but actually what I’ve learned, and this is thanks to Carter, is that his difference should be celebrated. He should never be scared or uncomfortable about how he looks, what kind of message is that for me to send my child?! I now welcome the stares and the questions, as long as they’re never directly hurtful. I want people to see every single freckle on my boys face and arms and legs and every little glimpse of brown skin under his shorts or when he lifts his arms and bares his tummy, I want them only to see how astoundingly beautiful he is. Because he is, truly beautiful and this isn’t just because he’s my son, its because he is a child with CMN and beauty is just one little part of this extraordinary syndrome. In my past life I worked in fashion, so clothes and aesthetics are a pretty big part of my world. If I dare to admit it to myself, I most probably had a pretty skewed view of what beauty was, I was nervous of anything too removed from the pages of the magazines I read and I hated the idea of not fitting in because I didn’t look the part. If only I had a time machine….I could teach my teenage, twenty something, even thirty something self so much now that I understand what really matters when it comes to how a person looks. It’s not hard to dress beauty and it’s been a joy to dress both my boys, but it is hard to dress a kid who has a back with skin like paper and so needs to be covered up and protected…but without wrapping him in cotton wool. When he plays with his brother they’re like lion cubs, tumbling and rolling around, never staying still, jumping and throwing themselves off sofas and bouncing endlessly on the trampoline. You could look at him and never ever know that there is anything he needs to be careful of and of course as he’s got older and more understanding of his skin, it’s much easier to manage. He knows his limitations and he also doesn’t want to get hurt so he’s cautious without really knowing it. When I couldn’t keep him in a baby-grow any more I started buying Osh Kosh dungarees in bulk from the US. I bought them in every style and size and he was never out of them. They became his own uniform and damn did he look cool! He loved those dungarees and although potty training had its challenges, we got through it and he kept on wearing them right up until age 5 when Osh Kosh stop making overalls for kids….which by the way is MADNESS. From dungarees we progressed to boiler suits – we started with a cotton red vintage one we found at the festival one sunny weekend. Carter’s favourite colour is red and the moment he saw it he wanted it. He put it straight on there and then and when he reached in to the pocket he pulled out a vintage snoopy handkerchief…Carter has slept with his Snoopy teddy (who he calls Dog Dog) since he was one week old and he loves that dog more than anything in this world. Boiler suits were our saviour, they still are, they have become part of his look and his identity and they have made him stand out in the way he should. He wears his school uniform just like everyone else but he always wears a vest and it is always tucked in tight. For sport he wears extra “skins” under his kit which really just help keep him warm and sometimes he wears a back protector when he’s playing football – he’s on the A team and is the best goalie they’ve ever had. Today as I look at him gleefully throwing himself around the trampoline, his hair is hanging loose down to his shoulders covered only by a black top hat, his camo boiler suit is covered in mud, his snoopy hi-tops lie abandoned in the flower bed and my adidas leather flight jacket, which he stole last week, looks better on him than it ever ever looked on me. A child should never be labelled. They should not be defined by that thing which makes them different or unique. But it is also important that the thing which makes them different should be celebrated and not hidden away. Carter is different, his skin is different and that’s something we can’t change and more importantly that we don’t want to change. It doesn’t mean his day to day life should be affected by his CMN but it does mean that he has to be aware of this difference and learn to protect himself both physically and psychologically. I have had to learn this too. I have had to find a balance between Carter’s privacy and wellbeing whilst being careful not to feel like I’m hiding him or alienating him from his peers. Of course I don’t want people to look at my boys and be thinking “which one is it who has the birthmark thingy?” but also why shouldn’t they be allowed to think that because he does have a birthmark thingy and if you’re lucky enough to get to know him, he might just show you. Thank you Carter for who you are and all that you’ve taught me. You’re my hero and I hope you always know that. I never really think these things through when I agree to do them. I’m proud of our home and more importantly I’m proud of Jay Jay and how he has curated our home to be a very happy and confident place to live. It’s also very lucky indeed that we both like the same things (well mostly) and that we enjoy looking at the things which we like, which make us happy and inspire us. All our bits and pieces scattered around the house are carefully positioned and considered and have a meaning. This brings me on to the word clutter….as far as I’m concerned, the collections we have in our home are NOT clutter. To me clutter are things which are just there for the sake of being there, bits and bobs that just gather on shelves and tables without intention. Stuff you can’t be bothered to put away or give away and that just become part of the furniture without you realising. That kind of stuff I don’t understand at all and it would muddle my brain and make life very messy indeed both practically and emotionally. So, my point is, the things in our home are not clutter. I’m not sure they really have a name,they’re just part of our lives and collectively they make our lives all the better. There were some lovely comments made at the foot of the article but typically the one citing “clutter” has stuck with me and so I just needed to have my say. 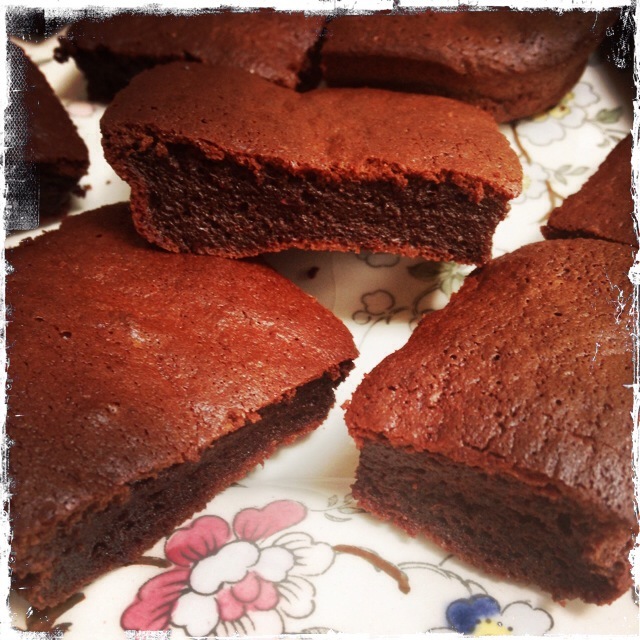 I’ve never been terribly bothered about cakes and sweet things. I’m not the kind of person to crave chocolate or dream of cream eclairs or lust over lashings of apple pie and custard….I’d rather have a bit of cheese on a cracker. However, things seem to have changed a bit although it’s not so much the eating of them but the making of them which now gives me the most enormous pleasure. The making but most of all, the decorating. I was told recently about Cressida Bell who is a British designer specialising in textiles and interiors but who also creates the most amazing cakes I have ever seen. After stalking her wondrous pieces of sugary art on Google images, I bought her book which is a fabulous collection of the most satisfying cake designs I’ve ever seen. 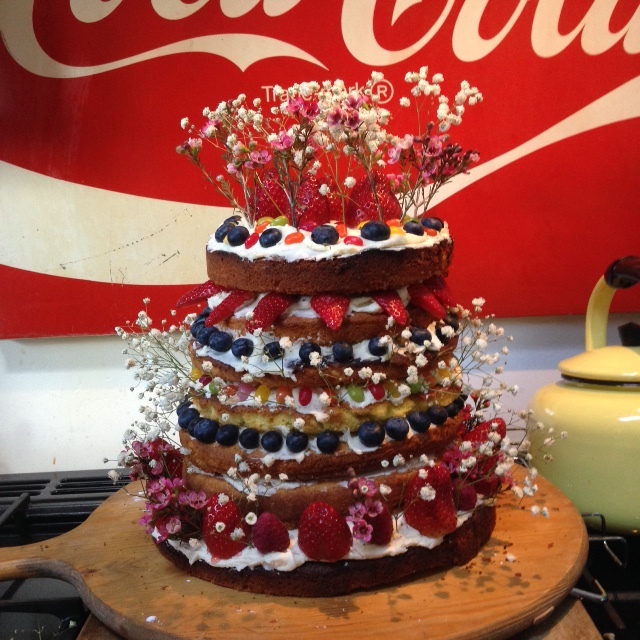 I haven’t tried my own version yet but I shall……just as soon as I’ve got these wonky, over the top, layered, fruit, flower and jelly bean creations out of my system. Above is one I made earlier and below are a few Cressida Bell made earlier – I’ve got some way to go but watch this space. My children’s birthday cakes will never be the same again. Thank you so much to Daisy Bridgewater, Simon Brown and the Saturday Telegraph Magazine for the brilliant article this weekend! We absolutely love it and Trevor the triceratops is basking in his new-found fame. Trevor the triceratops enjoys a game of croquet with the sons of his creator, Jay Jay Burridge, outside their Cotswolds house. The cottage is part of the Cornbury Park estate in Oxfordshire, and was turned into a single dwelling with a lateral conversion in 2013. The taller construction on the right would have been the original 18th-century farmhouse, the thatched part initially built as a barn. There was much debate, when I visited the home of the artist Jay Jay Burridge and his wife, Mel Moss, about where to put Trevor the triceratops. This surreal 7ft-tall foam dinosaur covered in sticky-backed plastic had just been taken out of storage for the summer and positioned on the lawn in front of their pretty 18th-century Cotswolds cottage. Moss was concerned Trevor would be a distraction and cause an accident in the procession of Audis that whistle past their drystone wall on the way to Waitrose. Burridge disagreed, delighting in the juxtaposition of prehistoric pop art with old-world charm. Dinosaurs are a recurrent theme in Burridge’s work, his most recent creations decorating the walls and ceilings of Jamie Oliver’s Diner, his close friend’s latest venture in Piccadilly, London. There, a full-size allosaurus stretches over the central stairwell, while dinosaur-themed rodeo posters hang from every wall. In 2010 Burridge made 11 lifesize dinosaurs for a show, When Superstars Ruled the World, at the Lazarides Gallery in Beverly Hills, depicting them drinking tea, playing music and generally hanging out. ‘Dinosaurs have been used so well in popular culture, but what interests me is dulling them down and making them mundane,’ he told me as we eventually repositioned the disturbingly lightweight Trevor out of harm’s way on the other side of the house. The couple originally rented the three-storey side of the house (the part with the tiled roof) as a semi-detached three-bedroom cottage. But when the neighbours decided to move on at the end of 2012 Burridge and Moss suggested to their landlord (the cottage is part of the Cornbury Park estate near Charlbury) that they take on the lease and knock the two dwellings into one. The landlord agreed, and in January 2013 a hole was drilled through the wall of the former cloakroom to link one house to the next. ‘The whole process only took a couple of months,’ Moss said. ‘We took out next door’s kitchen and turned it into the dining room, and built a step through the old cloakroom into the original kitchen, as the two houses are on slightly different levels.’ During the knock-through the builders found an ancient lintel in exactly the same place as the new opening, confirming Burridge’s suspicions that the property had originally been a single dwelling. Now functioning again as a single house, it gives the family the benefit of double the amount of living space on the ground floor, while maintaining a crucial degree of privacy on the second. ‘We still have two staircases,’ Moss said, ‘and you can’t get from one side of the house to the other upstairs; handy for when friends come to stay with young children as we can calm things down at bedtime and keep everyone separate.’ Upstairs in the second cottage are two guest bedrooms and a bathroom. ‘It’s the perfect arrangement,’ she added. Kitchen dresser : Much of the china, tin, pressed glass and enamelware on the kitchen dresser (bought at the Old Pill Factory in Witney;theoldpillfactory.com) has been found in brocantes in France, where the family spend a month every year. ‘Usually by the time we get home there is no space for anyone to get into the car,’ Moss says, ‘and the boys have to put up with things piled on their laps.’ The functioning black Bakelite telephone is a classic British model from the General Post Office. 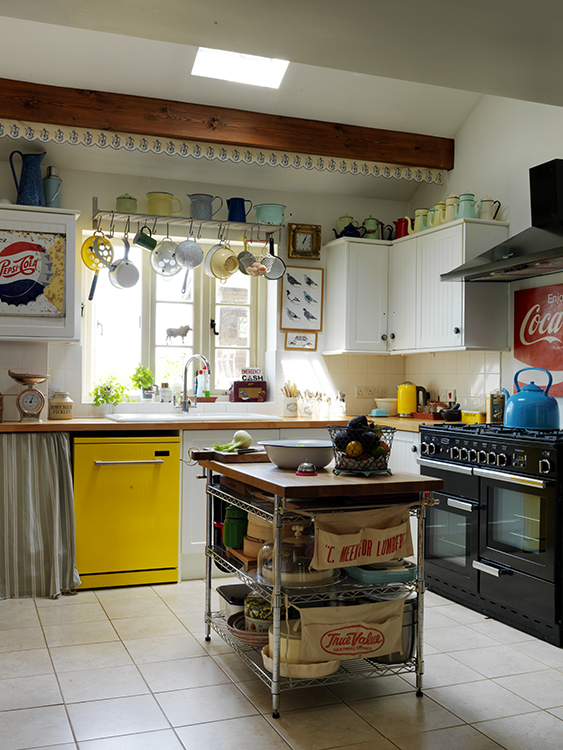 The large enamel vessels at the base of the dresser are used to store tea towels, pasta and rice. Dining Room : Before knocking through from one house to the other, kitchen units used to run the length of the wall below the window, a space now used as a dining room. The opening through to the kitchen passes through a former cloakroom, where a small step down needed to be created to compensate for the differing levels between the two dwellings. ‘I had hoped that it would all be on the same level – it would have been fun for the boys to rollerskate through – but it was impossible to tell until we knocked through,’ Burridge says. The boiler has been artfully hidden behind fabric by Cabbages & Roses. Fire buckets, hung from the ceiling, are filled with flowers. The room is painted with Farrow & Ball’s Pigeon. Office : More Trainersaurus Rex sculptures from Burridge’s When Superstars Ruled the World show are arranged on the window ledge. An Eames lounge chair and foot rest sit in front of a neon sign depicting a dinosaur as a pole dancer, also part of the show. The Star Wars picture is an enlarged version of something that Burridge drew as a seven-year-old. Living room : Following the knock-through the grown-ups have the pleasure of their own sitting room in the second cottage, while the children have taken over the family living room in the original house. The floral rug is from Anthropologie (anthropologie.eu). On a packing-crate coffee table sits a stainless-steel Trainersaurus Rex, one of the sculptures from Burridge’s 2010 show When Superstars Ruled the World. Modelled on Adidas trainers (the brand was one of the show’s sponsors), the shoes become dinosaur skulls with the addition of a moving set of heavily toothed jaws. 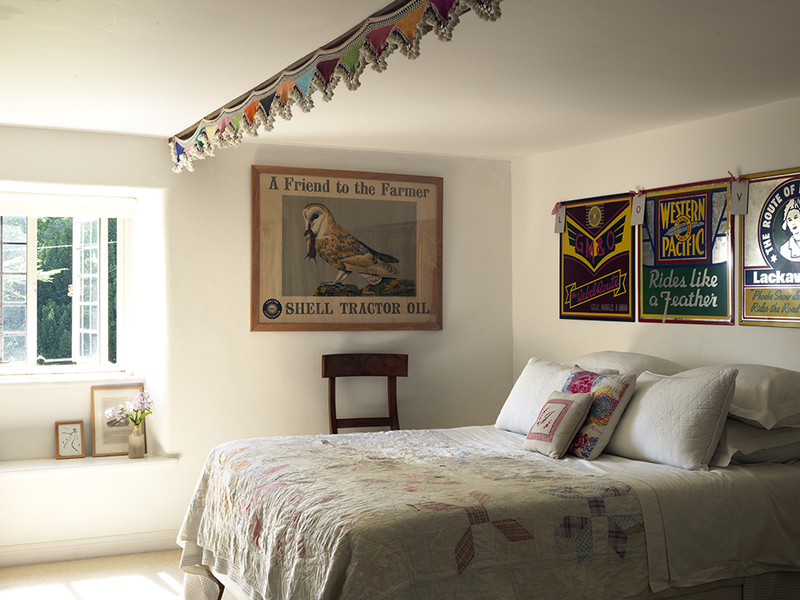 Master bedroom : A series of American railway logos printed on tin by the artist Ian Logan, Moss’s stepfather, hang above the bed. 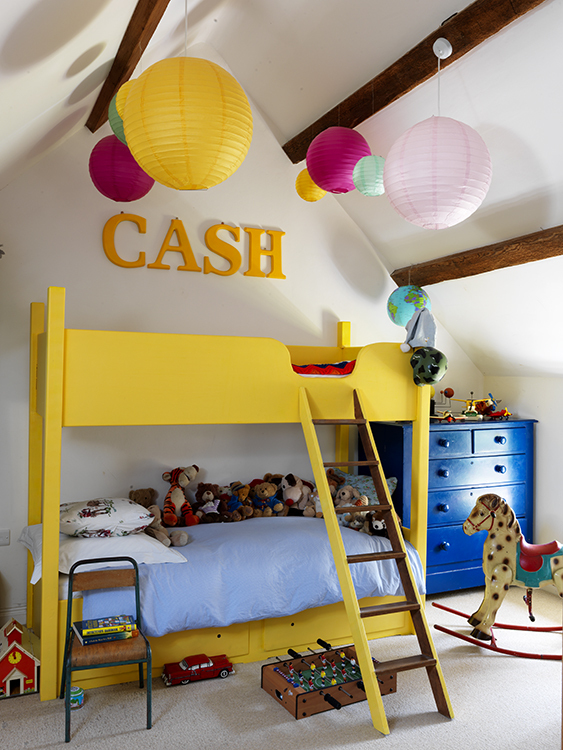 Cash’s bedroom : The bunk bed, made by the boys’ grandfather the artist Roger Burridge, has been painted a brilliant shade of bright yellow (Dulux Sunflower Symphony 4) by Moss. Coloured paper lanterns, bought on eBay for a party, hang from the beams.